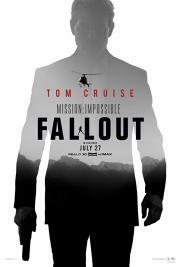 Tom Cruise wants to make sure you, the viewer, know how ridiculous the stunts are. Can't wait for an 80-year old Tom to be jumping out of planes and hanging off of helicopters. Quite possible the M:I films have outstripped the newer Bond films. Missão Impossível: Fallout não se limita ao espetáculo, ele abraça a ideia do Ethan Hunt como mito de uma maneira quase messiânica, sua moralidade é exaustivamente testada e sua força de vontade é (literalmente) esticada ao limite da Terra, chega a ser comovente. I think 4th and 5th movies were better but still this movie its a blast. Its just wanna do what it best at it. And nailing it. I fell asleep on my first watch. Guess I was just too tired, because this was actually pretty good. The plot is a little too convoluted, but the action and stunts make up for it. After Ghost Protocol the second best film of the series. The action scenes are awesome, but there isn't much tension in a bomb defusing when the stakes are impossibly high- we know the right wire will be cut, but in an entertaining way? Spoiler alert: yes, mostly. Also Tom Cruise on a motorcycle, and running, a lot. None of the twists/mask fakeouts are as inventive as in the best of the earlier movies. Cruise is a bit too super powered, falls great heights or accelerates through oncoming traffic/cross traffic too many times. I love 3, 4 and 5, but I had a lot of problems with this one. Car chases bore me and the plot was poorly structured. The last 30 minutes is however amazing. some terrific breakneck action scenes but the positively worst script thus far in the MI saga. This franchise has become one of the best action franchises with its focus on incredible stunt work. Cruise impresses and shows why he is unrivaled at what he does. The series has turned around is getting better with each new release. Its got insane action and really decent choreography. The plot is a little goofy at times but most spy films are. Cruise is hated by many but he is very good at what he does, and his dedication to stunt work etc. is admirable. Considered one of the top 200 movies of the past 20 years by Rotten Tomatoes, I find that I am in a minority. Too absurd and ridiculous to get a good score. Didn't keep me on the edge of my seat at all. I agree completely with MontyCircus' review. Yet another knockout entertainment from this very reliable action franchise. If you don't mind the excessive plottiness, that is. It's probably time to consider Tom for a special academy award for producing or for the stunt work he's done.